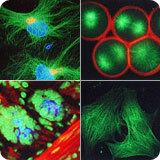 Laser scanning and spinning disk confocal microscopy are similar in technology but used for different purposes. Laser scanning confocal microscopy is most often used for viewing a fixed sample and can produce a very thin optical section. In most instruments, it is a slower process due to the time it takes for the laser to scan the sample point by point. Spinning disk confocal microscopy is most often used for live-cell samples, as less damage is done to the sample through photobleaching and so changes in the sample can be viewed over time. In both of these applications, high optical filter transmission is essential because in both cases the emission light must pass though pinholes before reaching the camera, decreasing the brightness of the image. Semrock'sBrightLine® filters have the highest transmission of any optical filters on the market. We also offer BrightLine filters specifically designed for the Yokogawa spinning disk confocal systems. These systems are considered to be the most advanced on the market and require specially-sized filters with exacting tolerances. The Yokogawa filters we offer are compatible with all scan head system configurations, regardless of the microscope, camera, and software platforms you have chosen.